The first Sunday of the WSL season featured Chelsea hitting six past Bristol City and ten-player Arsenal staging a dramatic late win over Birmingham City. Four second-half goals saw Chelsea run out 6-0 winners over Bristol City, after a diving Drew Spence header and tidy Fran Kirby finish had the Blues in control at the break. 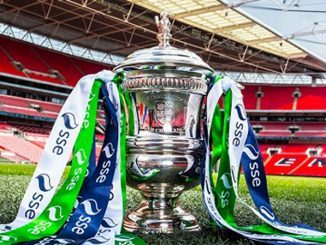 It was 3-0 when Karen Carney headed down a Gemma Davison cross for Maren Mjelde to coolly tuck home, Carney involved again with a corner kick for Magda Eriksson to head in the first of three goals in the last dozen minutes. Mjelde got her second tapping-in a Davison delivery and Gilly Flaherty bundled home the final goal from close range, as Chelsea topped the table after the first round of fixtures. 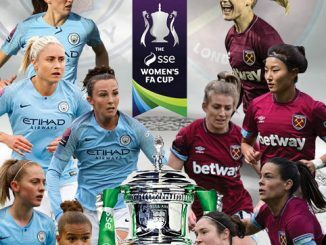 Izzy Christiansen converted a penalty to give Man City the lead at Huish Park and Jane Ross doubled the advantage shortly before the break, with a clever flick from Claire Emslie’s cut-back. Jill Scott added City’s third after the restart, her first time effort from 20 yards slipping under the Glovers’ keeper. Georgia Stanway came off the bench to make it 4-0 with 8 minutes left, Emslie again with the assist. 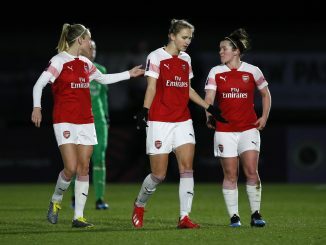 Arsenal twice came from behind against Birmingham City before grabbing all three points with a dramatic finish, despite a red card for Louise Quinn. A fine Andrine Hegerberg pass on the turn sent Ellen White away to fire City in front in the 12th minute, before Jodie Taylor equalised on 35 minutes with a smart finish across the keeper. But White had the Blues back in front just shy of the hour mark, tucking the ball away from the corner of the six-yard box, with Hegerberg again the provider. 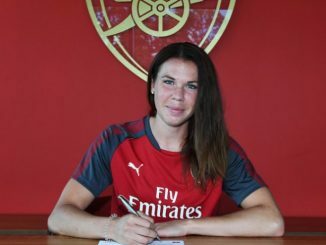 Now down to ten, the Gunners staged an amazing late comeback, as Taylor set up Lisa Evans to score 6 minutes from the end and then Taylor herself buried an 89th-minute spot-kick after Kerys Harrop’s handball. A poor touch by Reading keeper Mary Earps gifted Sunderland’s Simona Koren an open goal from the edge of the box after only 5 minutes. 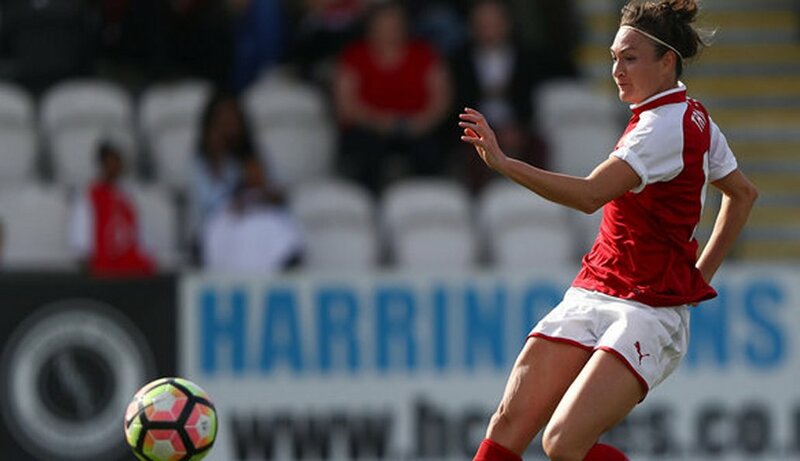 In the second half, Fara Williams saw her goal-bound effort blocked and Jade Moore headed narrowly over but the Royals were unable to find a leveller. Spurs narrowly lost on their WSL debut, as a swift exchange of goals just before half-time saw them lose 2-1 at Durham. Beth Hepple drilled the Wildcats ahead on 44 minutes from the edge of the box and moments later Bianca Baptiste curled home Tottenham’s first ever goal at this level. But in first-half stoppage-time, Emily Roberts set up Nicki Gears to restore the lead from 12 yards out. Hannah Mackenzie went close to a late leveller when her 30-yard strike had to be turned over by Helen Alderson. Doncaster were two goals to the good at London Bees at the midway point, Rebecca Rayner netting the first on 10 minutes from a Jess Sigsworth delivery and Kirsty Hanson scoring 8 minutes short of the interval. Christie Murray struck from 25 yards and Chloe Peplow picked out Rayner to chip in her second as Donny made sure of the p0ints in the last 10 minutes, while Tricia Gould got a late consolation for the Bees. The scoreline means the Belles lead WSL 2 after the opening weekend. Brighton broke the deadlock in first-half injury time at Aston Villa, where Ini Umotong netted a penalty at the second attempt, following Sian Rogers’ save. Villa almost replied during a goalmouth scramble in the 62nd minute but Katie Wilkinson’s shot was blocked on the line. Oxford United and Sheffield FC remained goalless at the end of the first 45, with the home side losing sjipper Haynes to injury. It needed an own-goal to break the deadlock, as on the hour, Oxford’s Danielle Carlton whipped in a cross and the unfortunate Ellie Gilliatt headed into her own net. The visitors had chances to draw level, particularly through Melissa Johnson but keeper Demi Lambourne did well to thwart her on more than one occasion. Watford took a mere 5 minutes to find the net at Millwall, as Simona Petkova steered in Bianca Bragg’s cut-back but the Lionesses were level inside 20 minutes, Billie Brooks nodding in from a corner. Millwall then took the lead close to half time, as Leanne Cowan went through one on one with the keeper and a two-goal cushion was achieved when Ellie Mason hit the crossbar from distance and Ella Rutherford poked in the rebound. Watford’s Rinsola Babajide was denied by the post before Megan Wynne won a penalty for the hosts, only for Jo Fletcher to get down well to make the save. The game was effectively over for the Hornets with Laura May Walkley’s second caution on 81 minutes.